If you would like to have accurate information of the patients face you can take a look at the company’s 3DMD and DI3D website. When you have pre and post information you can think about making a colour map to see the differences. I am doing some research for a friend who is studying medicine. to show accurate facial differences between well nourished and malnourished patients. Can you advise what software will do this for her? Alrite, so before making my new character, have been retopologizing my base mesh and its more or less finished, just have to end a few loops or whatever its called, and intend on shaping the form more after, so possible for some crit? I think you have a nice thing going there in general. I like the main flows especially at the back and on the tops of the shoulders. I will comment only on the body, now. The crits, then. I think you should definitely get rid of the points where six edges meet, aka poles, those do kinks in the shading and are most problematic in deformation areas such as the armpit. You have those there, in both front and back. I would reconsider the flows in the armpit and hips area. You may want to change the back of the joints, like elbow, so that the 'more mass', more polygons you have there, is directed to open when the limb bends. This is of course only my take, my 2 cents. Please see my take on body construction here. That and other related links from that article explain my reasoning better than I can do here. You can also download a tutorial on the body shown and the mesh itself, if you like. Hi folks. I’ve made a separate thread about my blog not far away from this one, which I will update whenever I write more modeling stuff, but I dare to link to the Topoly-relevant bits here, too. I’ve put some effort into topology research over the years. Please let me know what you think especially if you disagree strongly on something. I don’t claim to have everything down and sorted just right. 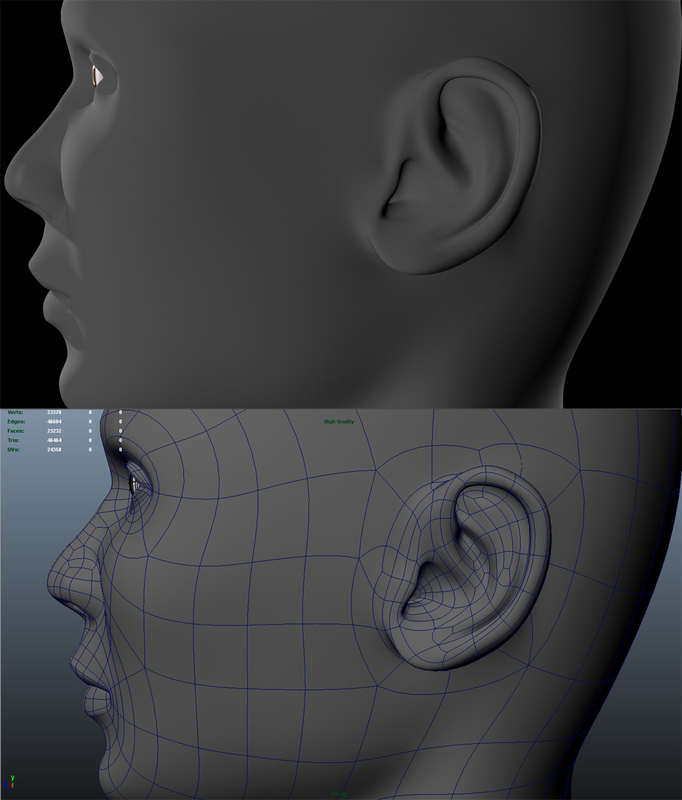 I’ve been looking at tons of tutorials and modelling the face from scratch over and over, I can never seem to get anything that looks good, whilst having nice topology. which is the most acceptable? In my opinion, if you make photos about yourself grimacing you could easily pick the proper topology of a face. My favourites for the overall face shape look are the one on left edge and the one on right edge, though I don't like the noses on them. You said nose is the tough one? A bit difficult to say just from the front view, but these faces seem to have a bit of tube-ish noses going on. The centermost looks best. -  I make sure the nose center goes lower than nostrils - I don't start making nostrils from nose bottom but from the side. - I make the nostril flare out and keep the actual nostril hole as asymmetric rounded shape. - I will direct one loop coming below the mouth to go around to the top of the nostril, defining part of nostril side and the nostril top, and then before crossing the nose bridge I turn it down to either cross the nose on the bottom or at the very front tip. I use this loop to define the nostril shape(with other loops) and to separate nostril shape from the main nose. If you look at your nose in the mirror, you should see this loop in action. I'm not sure if this helped at all when there is no pictures. Please see if these links help a bit more. You obviously have worked on the topology for a while. Keep up the good work. I’m working on a human male and could use some feedback on how I’m doing and if there’s stuff I should correct. No matter how much I’m looking at anatomy charts I feel I’ve become blind and can’t really see what to do next. Also on another note, I’m trying to find detailed info on where to go from now on, with the rest of the body and to use a correct edgeflow which allows natural and good looking deformation. Anyone know any tutorials or threads? You have nice head there. I shan't comment on anatomy. The head is a rather smooth and young, so some things people often like to add don't have to be visible. Well, one comment:  Even on young people the 'groove' of sorts going from side of the nostril down to side of the mouth is often visible. Might want to massage the loops you have already in place to add even just a hint of that. The topology is nice but could be better. I favour having only one pole(5 edges meeting) on each cheek. You could bring the 2 poles you have together - sort of expand the loops around both the eye and mouth so that they touch each other. So there would be no edges flowing between them going over the nose and to ears, like you have now. Doing this change will help you improve the flows overall and reduce polycount - do more with less. See this page for examples and futher advice. Check out the sweet nose as well - the one said to be the best. 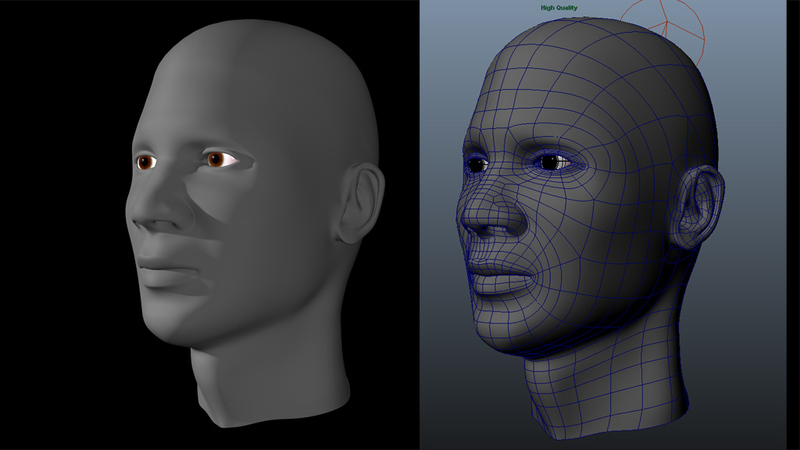 As for the body I have some links about polygon flows and body modeling listed in earlier message, see some post back. There is a tutorial too, but it is for a base mesh. Tutorial for a more detailed body modeling is in progress, though. I’m guessing others have seen this mesh already. impressive, ive never seen that one before. Kinda late for all the discussions we had here many months before, but here’s how most of our character faces look like nowadays. Is it subdivided or not? How do you make blendshapes, with displacement? It isn’t subdivided, it’s about 5500-6000 polygons. I model the shapes by hand, rigging up animated displacements is complicated, because we use referencing a lot. It’s also hard to make them with Zbrush if you want to modify the existing details (like smooth out wrinkles on the lips) especially now when 3.5 has a serious bug with subtools and re-importing. Cool character. With this number of polygons you can have fine control. I guess other parts of the body have a bit less polygons? Do you still use animated maps for small wrinkles, maybe normal maps? I had an idea topology must follow facial muscles, but as long as they are blended together smoothly in terms of transition (anatomically), maybe it’s a better idea just to follow general groups, without superimposing separate muscles. So I think topology looks good. Anyway, modeling humans requires anatomical knowledge, and when you know the muscles, it must be easier to take decisions about topology. Hi Laa-Yosh, just out of interest, could you elaborate on the nature of this bug? Has it not been fixed in ZB4? Well when you have multiple subtools in a ztool, Zbrush messes up the scale values for some or all of them at some point (maybe when you append a subtool, or when you split one into multiple ones). This does not have any effect on sculpting or creating normal/displacement maps (even morph targets are scaled up or down). But when you want to re-import a subtool for some reason, you’ll find that its scale is wrong and it gets too big or too small. This is a problem for our wrinkle map workflow, because it requires us to replace the first subdiv level with a version of the head model where the required facial blendshapes are applied (ie. 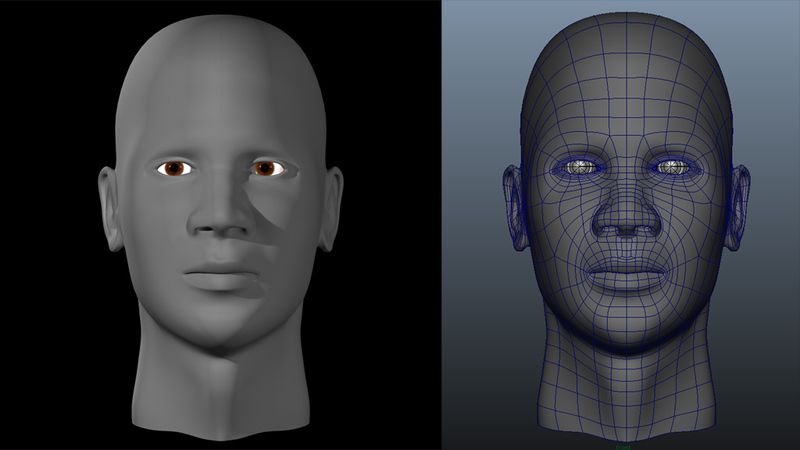 we make an angry face in Maya and export the result). Then we would sculpt details based on the existing highres Zbrush sculpt so that we could create new displacement/normal maps to blend into when the facial expressions are applied. Cool character. With this number of polygons you can have fine control. I guess other parts of the body have a bit less polygons? The entire character was detailed because of the close-ups, ended up about 200.000 polygons in total. Do you still use animated maps for small wrinkles, maybe normal maps? For the face? No, because the workflow would have been the same as for the displacements. The schedule was too short to do it, because it’s a complicated process on its own and on top of that Z3.5 introduced bugs and we didn’t have time to find a workaround as well. I had an idea topology must follow facial muscles, but as long as they are blended together smoothly in terms of transition (anatomically), maybe it’s a better idea just to follow general groups, without superimposing separate muscles. No, topology should not follow muscles, because those are under the surface - but what we see is the actual surface and that has another layer of deformations and interactions on top of the muscles. The loops should follow the directions that the skin slides in and should be parallel and perpendicular to those. Wrinkles are created where the skin would have to compress - but it prefers not to, so it folds on itself and creates those wrinkles instead. The area under the eyes where the crow’s feet are formed is a very good example where topology shouldn’t follow neither the forms nor the underlying muscles, but the skin fibers instead. The bridge of the nose is another good example and the jaw/throat are too. So I think topology looks good. Anyway, modeling humans requires anatomical knowledge, and when you know the muscles, it must be easier to take decisions about topology. That is however true, but you still need to look beyond the anatomy books and muscle charts too, for animated characters. Yes, you are right. There are so-called mimick folds, which go perpendicularly to muscles, as well as wrinkles go perpendicularly too. And yet there are fat tissues. “The loops should follow the directions that the skin slides in and should be parallel and perpendicular to those.” - that is a great point. Thank you for sharing. Sure I agree, unless you want to model ecorche-type characters.